John checked the door locks twice, then ripped off his tie and loosened his collar. He was drenched in sweat, and his hands were shaking. Had to be a trick. Gamer’s stunt. The fat slugs are probably laughing at me on the sim-net right now. No one had ever directly interacted with a Dreamer. No Dreamer had ever manifested an image within the living space of Avenir. Maybe one of his competitors had arranged this little show to trap him somehow, make him look ridiculous. It wouldn’t be the first time they’d tried. He gulped his drink and stared through the window at the bilious face of Eclectia as the liquor burned its way down his throat. He whirled around. The valet was still standing there, smiling at him. That voice. The wistful lilt and soft soprano tone. Hers. Think I'll tag along too, thank you. 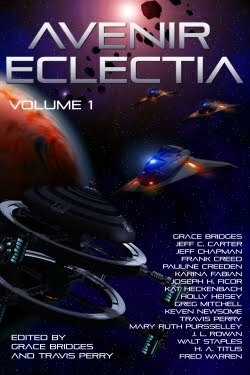 I really love the dimension this series of stories has added to the whole Avenir Eclectia world. Keep it up! It opens up so many possiblities. Stone the crows! To waste such fine alcohol! A man would think he saw a ghost or somethin'. ...and there will be a few more spilled drinks in Mr. Milton's future, I fear.